Hello everyone. 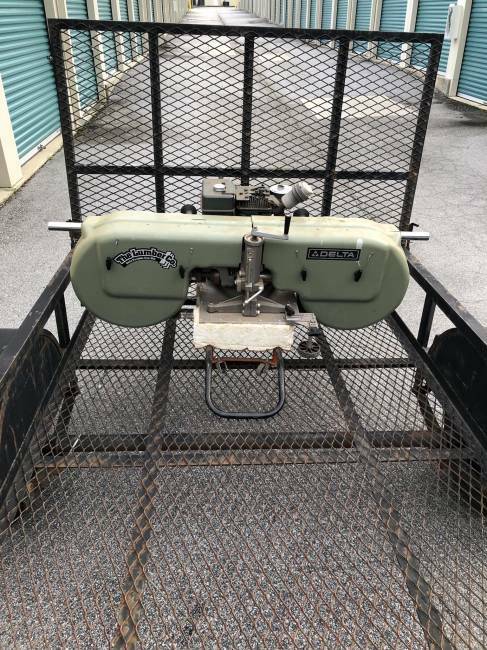 I just purchased an old Delta 36-360 bandsaw mill from a coworker. He was the original owner of this mill, and said he sawed around 8000bf of mixed hardwoods with it in the 80s and it’s sat in his garage since then. Everything on the mill still looks nearly new. Included with the sawmill itslef he had the ladder system for getting the first cut as well as 3 extra new blades and a dolly for moving it around. It started on the first pull of the rope. My father gave me a new Husqvarna 455 Rancher chainsaw, I will just have to pick it up the next time I’m able to go back to Arkansas to visit them. I’m excited about being able to saw some boards once I find a few logs. I know this is the most manual of manual mills and I will have my work cut out for me and a mandatory helper (once I find one of those also). I hope to learn a lot here. That is a very interesting sawmill, and Welcome to the Forestry Forum. I look forward to seeing some pictures/video of it sawing. Here is a photo of the saw before I put it in my storage. I bet that thing is made like a tank. Logs are easy to find just gotta meet the right guys. The first thing that popped into my mind is i bet it would be easy to make a set of rails and a carriage to run the mill on. Another coworker told me at work tonight that he has some Eastern Red Cedar that I can have. It's all blown over but not cut. They've been blown over for between 1 and 2 years. I have a question about milling them. 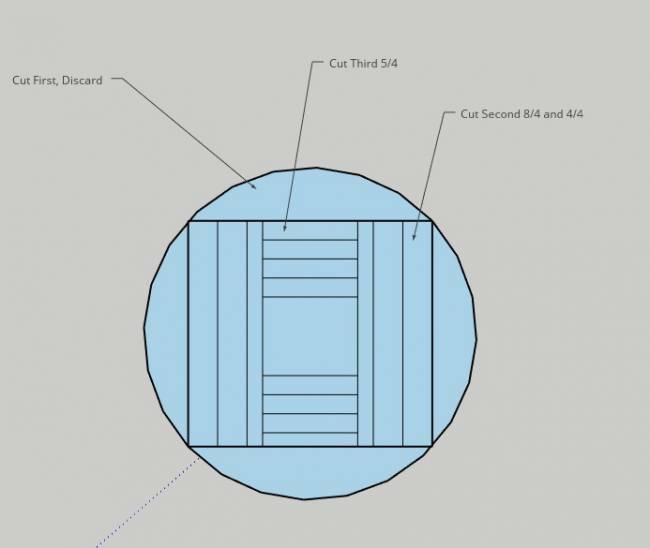 I think the proper action would be to mill them into a cant then mill that into the lumber I want, is this correct? I've attached a diagram that I made with my train of thought for milling the logs. It would yield 8/4, 5/4 and 4/4 lumber along with a 16/4 post from the pith. Would this post be usable or unstable because of the pith? Yeah, you are on the right track. You may be able to recover 4 more outside boards. Make the waste cut an inch higher, then cut off a live edge flitch that you put aside. Once you finish cutting the cant, reload the 4 flitches and edge those. You have to decide if the extra boards are worth the extra work of course, but your recovery % will be a lot better. Cedars often have a lot of taper, so you may recover some shorter boards from those outside slabs as well. Again this depends if you have a use for those, and if they are worth the trouble. A 4x4 post from the centre of the log is often a good option. The wood is basically low grade with the pith and knots. But it should stay straight if the pith is centred. Or sometimes the heart is rotted out, in which case you might end up throwing that piece away. And sometimes you adjust your sawing pattern on the fly when you see what's actually inside a log. ERC is very stable and those logs will already be fairly dry so I would not be concerned with nor avoid sawing through the pith. Saw whatever dimensions that you want or need. You have a great plan there, but a word of caution ERC is often full of surprises, bark inseams, healed over and holes, etc. I often cringe when I have a specific lumber list to provide in cedar as I know it will take me 1.5 or more times the logs to finish the order than one would expect. Be prepared to adjust your sawing plan based on what the log tells you it will give you. As Magicman said cedar is very forgiving, it is fun to saw, just not always fun to plan on what you will get out of it. No matter what, saw the log, have a good time, and show us the results. Just because you don't get your plan does not mean you won't have some beautiful wood. Live edge cedar mantles are very hot these days too. Thanks everyone for all of the replies. I am sure I’ll be able to get some lumber of some sort out of one of these trees so that I can post up some photos and/or videos of this saw in action. I do understand that my real logs won’t cut exactly like my drawing. I just filled the circle I drew with what would come out of it to get the idea across. It would have taken too much effort to draw a lifelike cross section. Is there a good book that I could possibly pick up at the library or buy to help me learn more of the basics of sawmilling? The diagram you drew is a great idea....if you have bigger diameter Cedar Logs. Most of our Cedar logs in the Carolinas are around the 6 - 10 inch range on the small end. A bigger Cedar log always gets my attention. Could have come off a fence line or from a yard where metal may be in it. I have actually found more rocks in Cedar logs than anything else but that just comes with the business. Black ants love to hibernate in a Cedar log if they have an opening to get in. Every part of a cedar log is marketable though. I sell bundles of the first cut slabs. I saw a cant out of a log....save the slabs. Then I saw 1 inch lumber from top to bottom. I stock 4, 6, 8, 10 inch wide lumber. Most of my stock is 4, 6 and 8..... more 6's than any size. Holes and imperfections can sell pretty quick depending on what the customer is looking for. I do not stock 2 x 4's or 2 x 6's.....however....I do keep a few logs saved for special orders. I rotate my saved logs as over time the white part of a cedar log will tend to break down. When I say rotate, I'll let a Cedar log lay for about 8 months. If i haven't sawn any special orders out of it.....its sawn into lumber and I replace these logs with fresher logs. I might get up your way one day. Hi was wondering if you would know the blade length as I need a blade mine didn't come with one. Same mill as the OP. Thanks for the link. Today I am a sawmill owner!! !